Properties in Reichsfeld average 4.7 out of 5 stars. Property 4: Gîte "La Maison aux Geraniums"
Superb 18th century farmhouse, in the heart of the vineyard. Property 29: Superb 18th century farmhouse, in the heart of the vineyard. New Kertzfeld cottage, luxury performance in Alsace countryside. 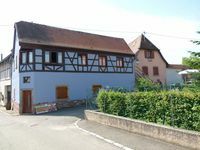 Property 43: New Kertzfeld cottage, luxury performance in Alsace countryside. Patricia and Laurent were amazing hosts, from the moment we arrived until the final &quot;Au Revoir.&quot; Laurent would claim that his English is not so good, but it was certainly far better than our French or German. We arrived in the afternoon to an exceedingly warm welcome and introduction to our apartment for the night. They also gave us an overview of local attractions. The apartment is on the second floor of a beautiful timber building and provided more than enough room and amenities for our family of four. Parking was easy as was our goal of visiting both the Strasbourg and Colmar Christmas markets. We slept soundly and were indeed sad to leave the following day, but Patricia gave us treat for the road as we departed. Driving away through the beautiful Alsacian countryside (it was indeed magnificent, even on a rainy day) ,my wife, who loved every minute of our stay with our young children and indeed lives her whole life for our them, said that she wants to return someday and leave the children with their grandparents. Our 6 day stay was a very enjoyable experience. The cottage was lovely...clean, well-furnished, a great place to call &ldquo;home&rdquo;. The town of Dambach is a delight; centrally located in the Alsace, charming and full of friendly, helpful people. Great hiking right outside your door. Our hosts were extremely helpful in every way! Sure hope we can stay again in the future. Highly recommend!